Now in its sixth year, the Meetings Show is firmly established for conference networking internationally, with the added prestige of being opened by the chairman of the All-Party Parliamentary Group for Events. After cutting the ribbon, James Heappey MP joined 15 professionals in a discussion entitled A winning welcome; securing business for Britain. Discounting the “short-term political uncertainty” of Brexit, he was upbeat, although he recommended a national approach to winning bookings, whether to Wales, Scotland or English regions. The show itself testified to continued interest in Britain for both incoming and outgoing conference-goers. 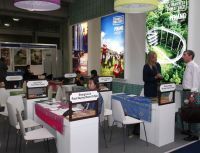 There were more than 700 exhibitors covering 136 countries, although many of these simply reflected operations by Liberty International or Moulden Marketing, just two of the 78 destination management companies at the show. Even so, international exhibitors occupied half of the Grand Hall, and included 17 of the 47 newcomers, ranging from Radisson to JG Collection and from Rwanda’s convention bureau to Italia Connection, which was among 75 destination management companies. Meetings Show made a distinction between conference venues and centres for exhibitions or conferences, listing 58 and 48 respectively, although some sites or places were duplicated. A good 23 cities were represented by convention bureaux; they included Hamburg and Singapore as well as New York, Toronto and Vancouver. Malaysia was among seven Asian countries directly represented, with Penang expanding its presence from two to eight representatives, led by Yasmin Bathanamathan. She expects to double the team next year. A couple of tourist boards were from South America, and the Gulf states had a solid presence, but continental resorts, venues and hotels loomed larger. Spain and Italy were well represented, but the largest contingent was probably German, including the Steigenberger group highlightng its JAZ and MAXX brands. In fact, the show was dominated by 198 exhibitors from hotels, both independent and in groups, challenged to explain ever-changing ownership and differentiated marketing. “We are educating buyers about the 20 brands among our 9,000 hotels in 80 countries”, said Ria Batson of Wyndham, while Michael Wiseman of Marriott spoke similarly about his group’s 6,000 establishments in 120 countries because the 30 brands range from Sheraton to Bulgari. Barcelo was keen to project its stability since 1931 as a family business that runs 245 hotels in 22 countries, and the same went for Cairn Group, whose owner, Neeraj Handa, attended the show. His base, Newcastle/Gateshead, gets flights from Paris and Stavanger on top of the DFDS link to Amsterdam, and the venue initiated direct funding with Leeds, Liverpool and Manchester in 2015. 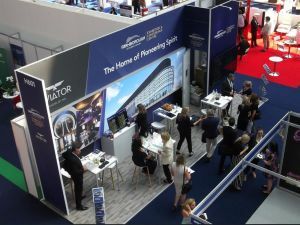 Venues of Excellence also had a stand to promote 44 sites that offer a total of 4,000 bedrooms and 900 meeting rooms in cities as far apart as Cambridge, Bristol and Glasgow. Other sites for gatherings included nine sports centres and 13 seats of learning in England and Scotland. Present for the second year running was Farnborough’s new show centre that has already hosted the Big One and Screwfix. Air Malta was among eight airlines represented, while a dozen exhibitors covered ground transport, but cruise lines have yet to make their debut. The other categories of exhibitor were providers of services such as venuedirectory.com and technological aids such as Shocklogic. How artifical Intelligence is disrupting the Event Industry and The Death of Traditional Conferences featured among 68 lectures or workshops, although one-to-one sessions have been dropped. The subjects ranged from catering to ticketing and from security to sustainability. More than 2,000 professionals visited the show, and while official figures are awaited for the key indicator of hosted buyers (who have a special lounge), several exhibitors saw an upsurge. Vilnius reported ten appointments for the first day alone, Conference Badges 14 and Newbury Racecourse 200. The unprecedented activity suggests an increase on last year’s total of 12,000 scheduled appointments, according to the show’s marketing manageress, Rochelle Jayawardena, who said: “We have cut the show from three to two days, offering intensified focus and concentrated space." Organised by Centaur Live, the show has an advisory board of 17 members who include directors from Visit Britain and QEII Centre. There is also partnership with 52 bodies that range from the Event Marketing Association to the Association of British Professional Conference Organisers, while some of these are also numbered among 16 supporting associations. Chief among the latter are the International Association of Congress Centres (IACC) and the International Congress & Convention Association (ICCA). Thanks to a marketing award from the latter, Antwerp exhibited for free at this year's show.